Front Cover: For Azerbaijanis, much of the 20th century has been marked by Big Brother's constant watch, much like the unblinking, piercing gaze of the Richard Zorge memorial sculpture on Samad Vurgun Street in Baku. Zorge, a Baku-born German, spied for the Soviets during World War II, warning them that the Germans intended to attack on June 21, 1941. Zorge was later assigned to Japan where he was executed when they discovered that he was a spy. 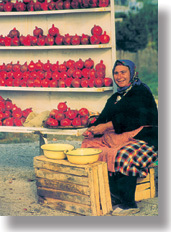 Back Cover: You know the autumn chill is on its way when roadside vendors start selling pomegranates. Photo: Blair. 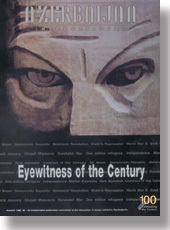 Many of the photos in this issue came from the Azerbaijan Republic State Archives of Cinema and Photography. In this issue, such photo credits are abbreviated as "National Archives." Deep appreciation goes to Director Nina Fisheva for her tremendous contribution to our 1999 series: "Celebrating the Century".